Realizing an asteroid sample return mission is a complex undertaking from a trajectory standpoint as it requires a large repertoire of flight dynamics and navigation tools to deliver the OSIRIS-REx spacecraft into proximity to asteroid Bennu, navigate it to a gentle touch and go for the collection of sample material and then guide it back to Earth and target a precise re-entry. The OSIRIS-REx mission has a baseline duration of seven years taking advantage of close approaches of asteroid Bennu and Earth that occur every six years. 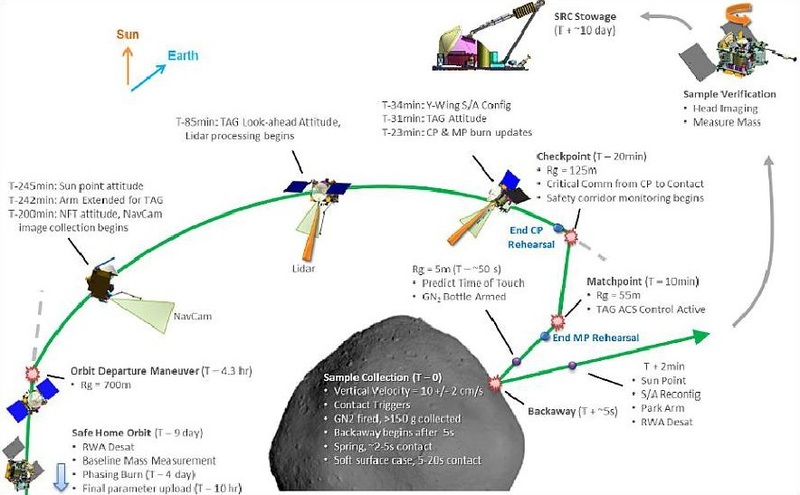 The lengthy mission can be broken down into a number of phases: launch, Earth flyby, cruise to Bennu, asteroid survey, orbit and reconnaissance; Touch-and-Go Sample Acquisition, quiescent proximity operations, return cruise and re-entry. The baseline mission design for OSIRIS-REx calls for liftoff in September/October 2016 during a 39-day launch period with daily opportunities to deliver the spacecraft into an orbit around the sun. 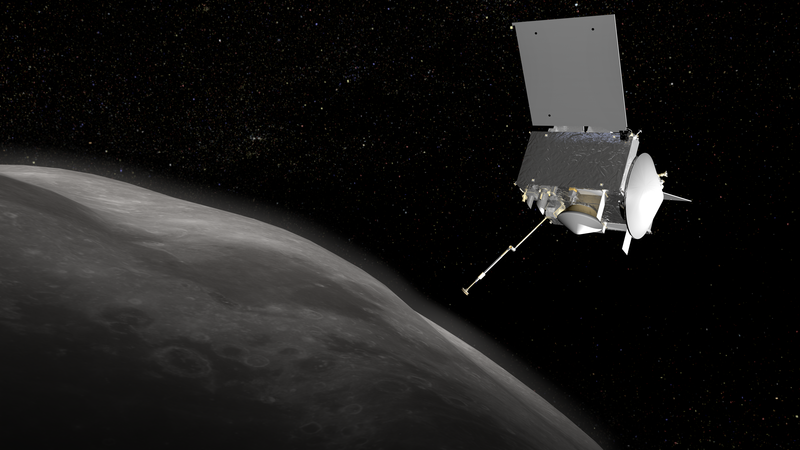 At the farthest distance from the sun, OSIRIS-Rex performs Deep Space Maneuver to aim for Earth to make a gravity assist flyby one year after launch enabling the craft to reach asteroid Bennu. Arrival at the asteroid is set for August 2018 with OSIRIS-REx first flying in tandem at a five-Kilometer sequence before entering a one-Kilometer polar orbit for a year-long surveying campaign, creating a high-resolution global data set containing color images, altimeter data and spectrographic data. 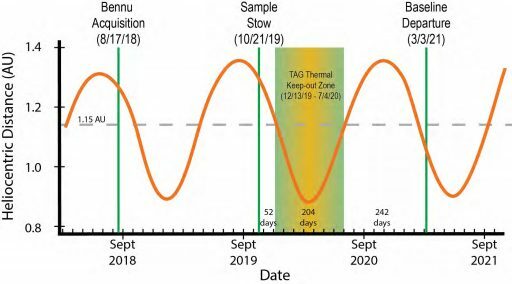 The Touch-And-Go Sample Acquisition campaign lasts at least two months with two trial runs before the actual contact maneuver around July 2020. Bennu and OSIRIS-REx part ways in March 2021 when the spacecraft fires up its engines to boost itself on a course back to Earth. On September 24, 2023, a journey of seven years will come to a high-speed conclusion when OSIRIS-REx deploys it Sample Return Capsule onto a re-entry path while itself maneuvering to fly past Earth. 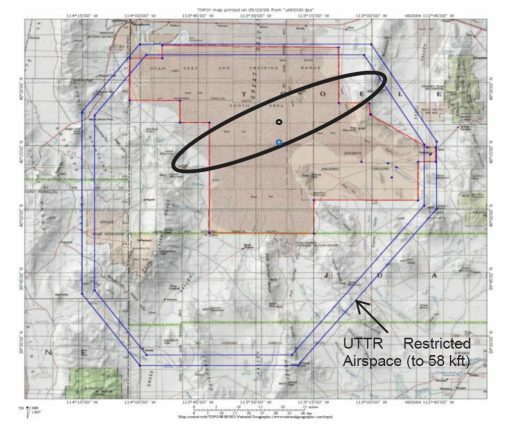 Touchdown in a testing range in Utah is expected at 14:52 UTC to mark the return of up to two Kilograms of asteroid sample. 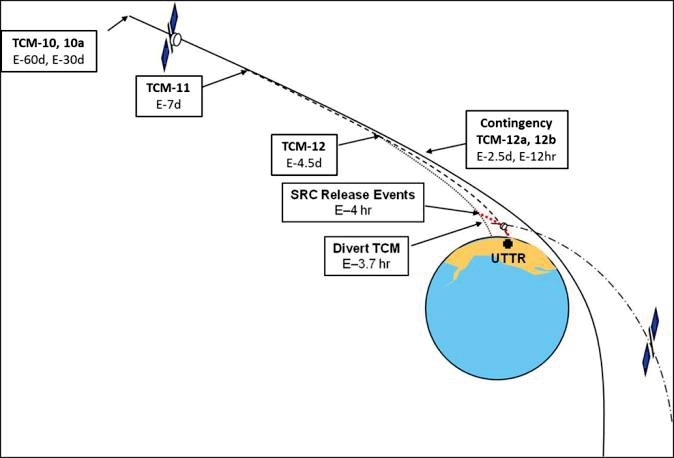 The following is a detailed break-down of the OSIRIS-REx mission from a trajectory design standpoint, covering its trip to asteroid Bennu, proximity and sampling operations at the asteroid, the return to Earth and finally the re-entry design that will put a close to a historic mission. The OSIRIS-REx mission uses an Atlas V launch vehicle built and operated by United Launch Alliance. The configuration used will be the 411 comprised of the Common Core Booster powered by a Russian-built RD-180 engine with the trusted RL-10C-powered Centaur sitting on top. Attached to the first stage is a single Solid Rocket Booster, increasing the rocket’s throw capability to match the performance needed by OSIRIS-REx to reach asteroid Bennu. 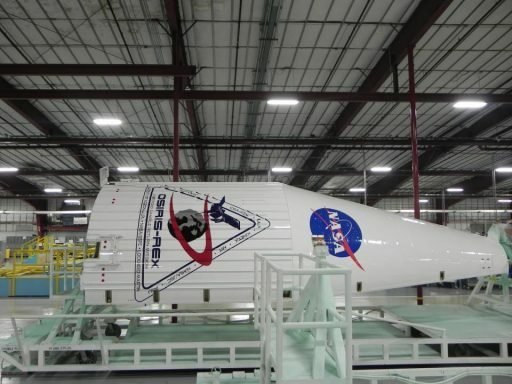 The spacecraft will be shrouded in a four-meter diameter payload fairing. 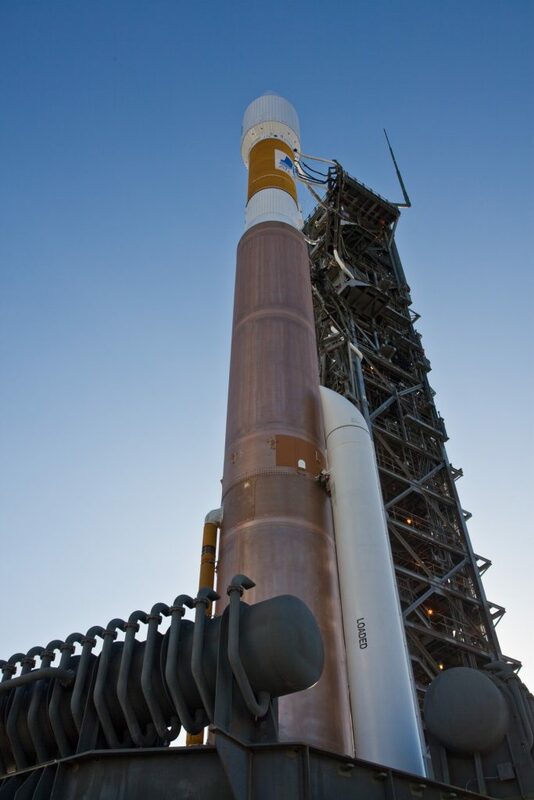 The Atlas V 411 is one of the more odd-looking versions of the workhorse launcher with only one Solid Rocket Booster that creates an imbalanced appearance after liftoff because of the off-axial thrust moment delivered by the lone SRB. This requires compensation by the RD-180 which gimbals to re-direct its thrust and allow Atlas V 411 to rise vertically. The Pre-Launch Mission Phase for OSIRIS-REx begins one day prior to launch and lasts until the spacecraft is switched to internal power shortly before liftoff. By this point, all integrated testing will be complete and Atlas V will move to its launch pad at Space Launch Complex 41 at Cape Canaveral Air Force Station. As a mission constrained by an interplanetary launch window, the launch processing flow includes a Wet Dress Rehearsal that has been removed from regular Atlas V missions to save cost and accelerate the schedule, though missions with tight windows may still utilize the test as an added verification of launch vehicle readiness prior to launch day. The Atlas V 411 rocket stands over 58 meters tall, has a core stage diameter of 3.81 meters and a launch mass of approximately 381 metric tons. 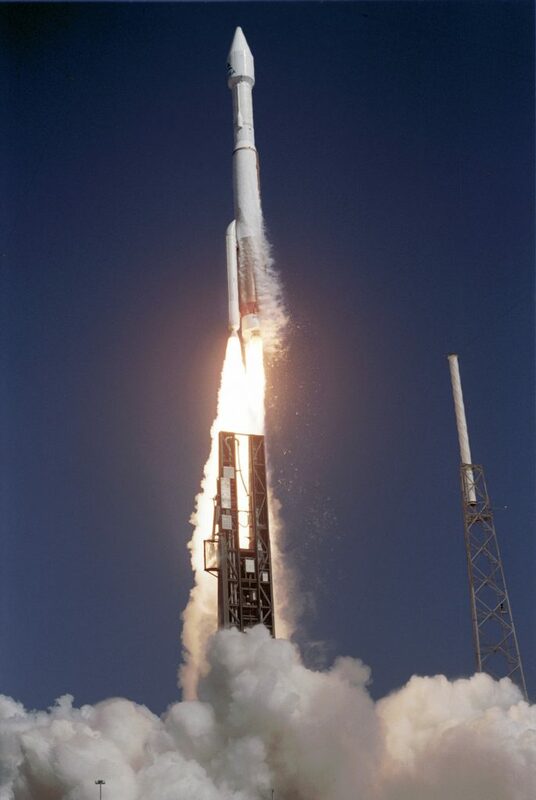 This particular version – because of its narrow performance window between the 401 without boosters and the 421 with two – has only flown three times before: in 2006 with the commercial Astra 1KR communications satellite and in 08/11 with the classified NROL-28 and 34 payloads. OSIRIS-REx has a 34-day launch period with a two-hour daily window – giving the mission plenty of time to get off the ground even in case of periods of bad weather or technical issues. 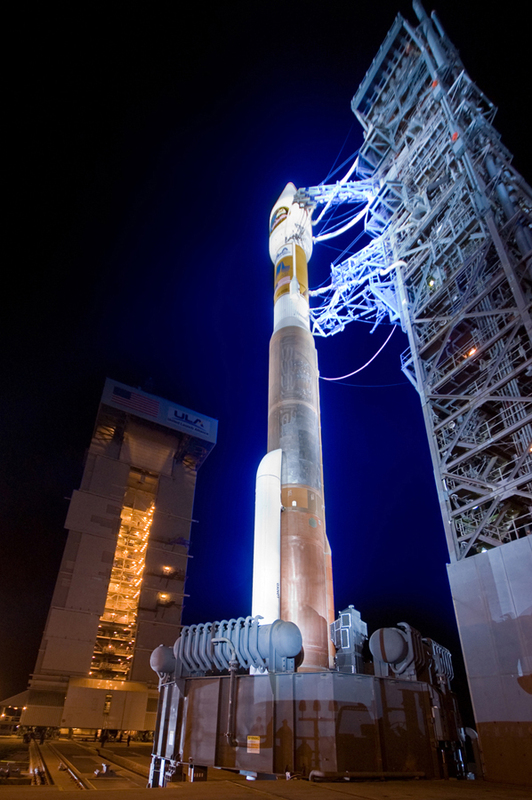 On Launch Day, Atlas V countdown operations get underway 7 hours ahead of the opening of the day’s launch window. Initial countdown operations include voice checks between the launch team members and the first poll of the countdown ahead of Atlas V Power-Up. Following the activation of the launcher, teams begin a series of checkouts of the electrical system of the rocket. Meanwhile, at the launch pad, technicians complete final hands-on work to set up for tanking which picks up after a countdown hold at T-2 hours. The complex procedure to load the two stages of the rocket with cryogenics begins with the chilldown of ground support equipment and transfer lines and tanks chilldown on the Liquid Oxygen side. Liquid Oxygen starts flowing into the Centaur upper stage tanks shortly thereafter. Propellant loading starts in slow fill mode until the initial portion of the tank is filled. Then, fueling transitions to fast fill until the tank reaches 95% for LOX and 97% for Liquid Hydrogen. The final part of propellant loading is completed in Topping mode. Centaur LOX loading takes about 40 minutes as 15,700 liters of –183-degree Celsius oxidizer are filled into the upper stage. Once Centaur is into propellant loading, the large Liquid Oxygen tank of the Common Core Booster also starts fueling. LOX load on the CCB also moves through the three steps, slow-fill, fast-fill and topping. Only LOX is loaded on launch day, Kerosene loading occurs prior to the countdown. The large Common Core Booster stands 32.46 meters tall with a diameter of 3.81m and a fuel load of 185,500 liters of LOX and 94,600 liters of RP-1. The final tank to be loaded during the countdown is the Liquid Hydrogen Tank of the upper stage that also goes through the usual steps. Centaur is loaded with a total of 48,100 liters of -253-degree Celsius LH2 fuel; the stage is 12.68 meters tall and 3.05 meters in diameter. Once clocks reach T-4 Minutes, the countdown enters its final built-in hold. This hold is variable in duration and can be extended in case of technical issues or uncooperative weather. During the hold, the launch team receives a final weather briefing and performs the GO/No GO Poll for Terminal Countdown. During the hold, OSIRIS-REx is transitioned to its flight mode and switches to onboard power with the spacecraft team voicing their final GO to the launch team. At T-2.7 seconds, the massive two-chamber RD-180 main engine of the Common Core Booster ignites and soars up to its full liftoff thrust of 390,250 Kilogram-force. Engine start-up is closely monitored by flight computers to make sure it reaches operational conditions before the launcher is committed to flight by igniting the booster, raising the vehicle’s thrust to 563-metric tone-force. Immediately after liftoff, the oddity of the Atlas V 411 will come to light with the booster’s plume very prominent on one side of the vehicle and the RD-180’s exhaust slightly deflected to compensate for the imbalanced thrust moment that is the result of the use of only one booster. After ascending vertically for 7 seconds, the Atlas V will begin its pitch and roll maneuver to align itself with its pre-determined flight path, departing Florida’s Space Coast. Less than a minute after lifting of, the Atlas V passes Mach 1 followed by Maximum Dynamic Pressure about 69 seconds into the flight. The single booster will deliver an average thrust of 172 metric-ton force over the course of a 94-second burn, consuming nearly 41 metric tons of propellant. After thrust tails off on the lone booster, Atlas V will continue holding it until T+2 minutes and nine seconds to ensure a safe downrange splashdown in the Atlantic. With the booster gone, Atlas V will switch from flying a pre-programmed attitude profile to the Zero-Angle of Attack phase, beginning to use navigation data to adjust its flight path in order to meet its cutoff targets. As the first stage approaches the 4-minute mark into the flight, it will start throttling down its RD-180 engine to maintain a maximum acceleration of 5 Gs. After a burn of four minutes and three seconds, the first stage will shut down its RD-180 engine that will have done its job. Six seconds after BECO, pyrotechnics will be fired to separate the Common Core Booster that then uses eight small solid rocket motors to move away from the Centaur upper stage. Ten seconds after staging, the RL-10A engine of the Centaur Upper Stage will ignite on its first of two burns with a total vacuum thrust of 10,100 Kilogram-force. Payload fairing separation occurs a eight seconds after second stage ignition, exposing the OSIRIS-REx spacecraft for the rest of its ride into space as aerodynamic forces can no longer harm the delicate spacecraft structure at an altitude of over 100 Kilometers. The first burn – eight minutes and four seconds in duration – lifts the stack into a slightly elliptical parking orbit, inclined 28.5 degrees ahead of a coast phase of 21 minutes during which the vehicle will fly passively in its preliminary orbit. During the coast phase, the stack performs a PTC Roll to evenly distribute sun exposure on the vehicle and Centaur performs regular RCS thermal conditioning firings. The coast sets up the proper insertion conditions for the targeted heliocentric orbit. When the coast phase is complete, Centaur re-starts its RL-10 engine for a burn of six minutes and 50 seconds. OSIRIS-REx is aiming for a characteristic energy (C3) of 29.3km²/s² and a hyperbolic escape velocity of 5.41 Kilometers per second. At the conclusion of the burn, Centaur will start a re-orientation to the proper attitude for spacecraft separation after a 15-minute coast phase. OSIRIS-REx is sent on its way between T+55 minutes and T+59 minutes depending on where within the day’s launch window liftoff takes place as a result of slightly different trajectory solutions for each discrete launch opportunity within the window. Separation of OSIRIS-REx marks the completion of the mission for Atlas V, though Centaur will still be tasked with its standard Collision and Contamination Avoidance Maneuver to ensure no re-contact occurs with OSIRIS-REx. 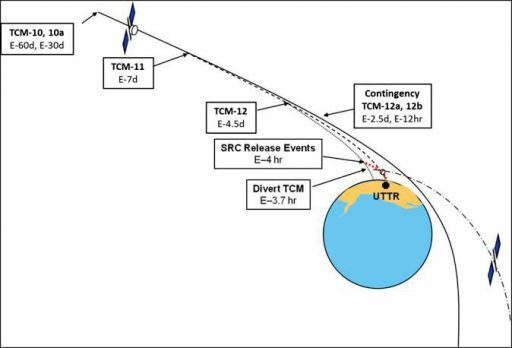 Spacecraft separation will trigger a time-tagged command sequence aboard the OSIRIS-REx spacecraft. 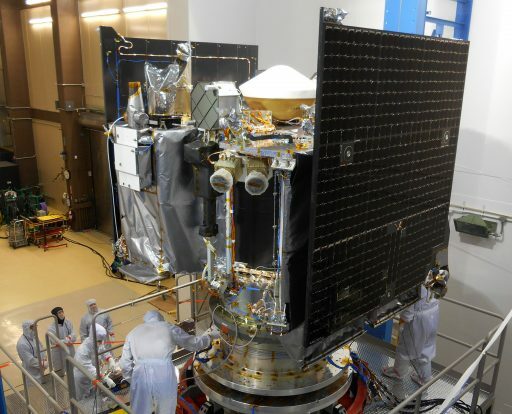 OSIRIS-REx will quickly power up its transmitters to deliver low data rate telemetry to provide the Mission Team with a confirmation of spacecraft health shortly after entering space. Initial signals from the spacecraft will be captured by the Canberra ground station in Australia around 17 minutes after spacecraft separation. A critical post-launch event is the acquisition of a stable attitude with body rates reduced to safe levels for the deployment of the solar arrays. 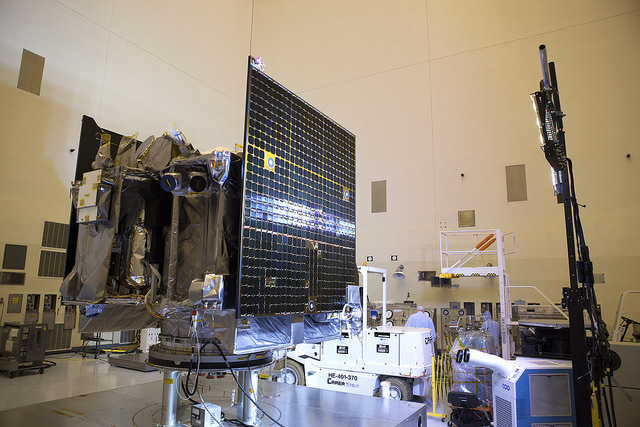 Solar Array deployment occurs a few minutes after spacecraft separation and OSIRIS-REx will be in a pre-programmed safe mode, using Inertial Measurement Unit and Sun Sensor data to point the solar arrays toward the sun for power generation to re-charge the vehicle’s batteries. With a power-positive spacecraft, the Mission Team will enter a four-week initial commissioning phase. Ranging operations will be performed over the course of the first days of the mission to get a precise trajectory and assess if any immediate corrections will be needed via a propulsive maneuver. Over the course of the first four weeks of the mission, OSIRIS-REx will undergo detailed checkouts, starting with the spacecraft core systems before power-up of the instruments for electrical checkouts. 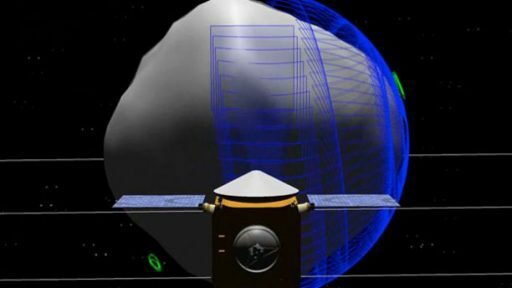 Instead of flying a direct trajectory to Bennu, OSIRIS-REx will conduct an Earth Flyby one year after launch to boost its velocity. A direct trajectory would have required a larger launch vehicle coming at a cost beyond the mission’s budget. Additionally, flyby trajectories provide a welcome opportunity for testing of the spacecraft instruments in an operational environment. 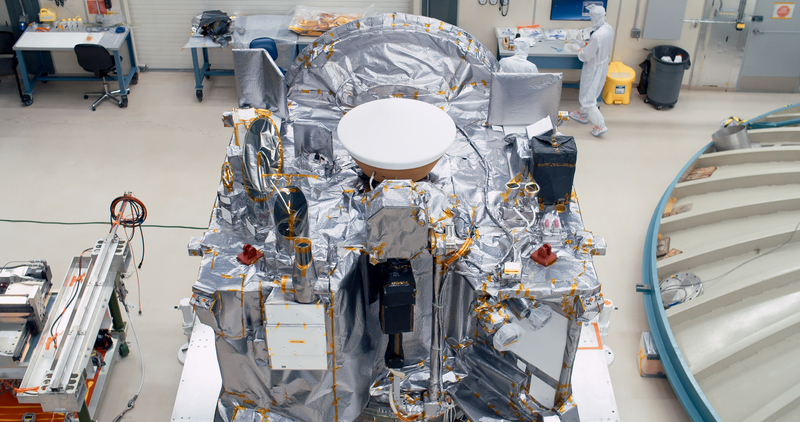 The total Inbound Cruise duration for OSIRIS-REx is 712 days from October 5, 2016 to August 17, 2018. 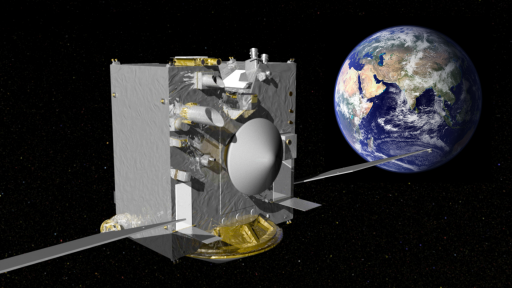 To line up the Earth Flyby, OSIRIS-REx completes a series of Deep Space Maneuvers starting in January 2017. These maneuvers use the spacecraft’s four MR-107 main engines, each generating 200 Newtons of thrust, for a total change in velocity of 520 meters per second. Prior to the Deep Space Maneuvers, the spacecraft will prime its propulsion system by opening pyrovalves within the pressurization system to allow Helium into the propellant tank to maintain a constant pressure during the main engine burns. Multiple Trajectory Correction Maneuvers will occur to clean up the large main engine burns and fine-tune the Earth flyby trajectory. 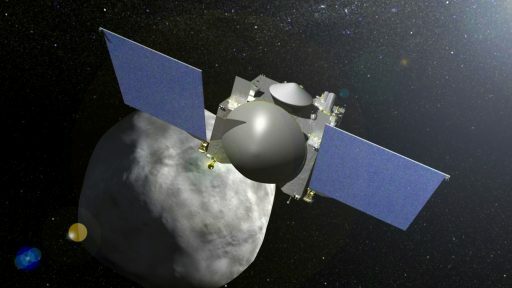 At Launch +6 months, OSIRIS-REx enters its first instrument calibration campaign to ready the payloads for the Earth flyby which will be used as a rehearsal of remote sensing at the asteroid, also providing an opportunity for the collection of calibration data. 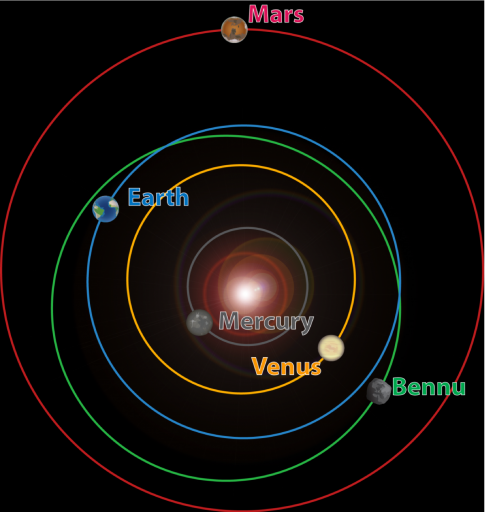 The Earth Flyby has the purpose of increasing the spacecraft’s heliocentric velocity and modify the orbital inclination to six degrees in order to match that of asteroid Bennu. 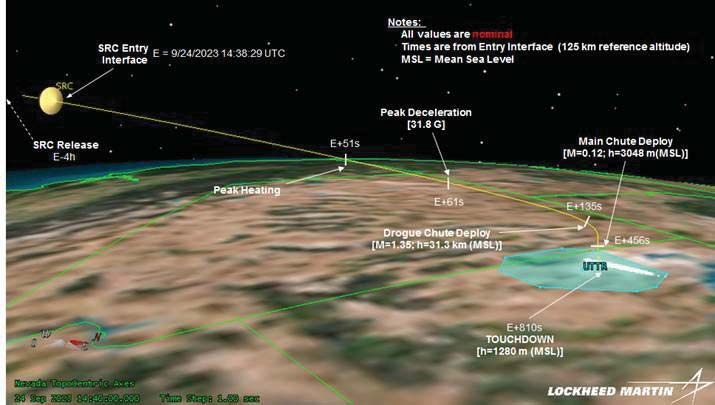 The Earth Flyby targets an altitude of around 20,000 Kilometers and has plenty margin to perform hazard avoidance maneuvers, but generally a higher flyby altitude is preferred over a lower pass. In case of a higher flyby, residual dV would have to be provided by the spacecraft. 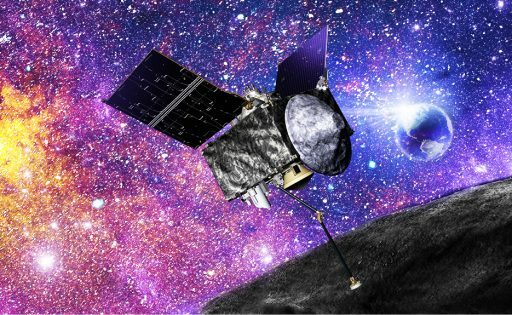 The OSIRIS-REx Approach Phase starts on August 17, 2018 when the spacecraft’s long-range PolyCam will detect the asteroid. Bennu acquisition in PolyCam images will show the asteroid as a spot of light within the star-filled sky. Acquisition is expected at a range of two million Kilometers. Major rendezvous burns will slow the spacecraft by 530 meters per second to achieve an approach speed of only 0.2 meters per second. 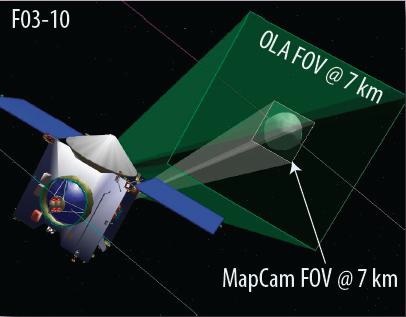 Navigation during the approach phase is accomplished using ranging data to assess the spacecraft’s trajectory as well as optical navigation with the PolyCam and NavCam cameras. Arrival at Bennu will be marked around November 18, 2018 when OSIRIS-REx arrives at a distance of five Kilometers where the approach will be halted for a period of tandem flying at the 5km distance. The OSIRIS-REx mission at asteroid Bennu can be broken down in two major phases, the first known as Baseline Asteroid Operations of 739 days and a Quiescent Phase of 191 days which are available as operational margin. 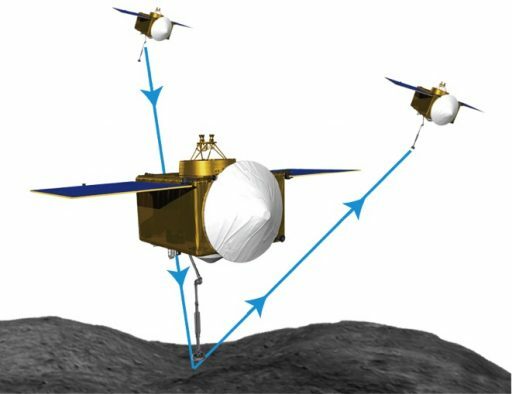 The actual duration of the various mission phases at Bennu is very flexible and depends on the progress of the mission and is driven by desired scientific observations. In addition, taking advantage of surplus propellants, the OSIRIS-REx mission team may elect to opt for either an Early Departure to get the sample back to Earth earlier than planned or set up a Late Departure to maximize the time available for remote sensing at asteroid Bennu. Both of these options are described in detail here. Arriving at a point five Kilometers from Bennu, OSIRIS-REx enters a 20-day Survey Campaign from where the entire asteroid can be imaged, a topographic shape model can be generated and preliminary spectral data can be collected. During the Survey Phase, a list of 12 potential landing sites will be selected which fit the safety and operational requirements for the Touch-and-Go sample collection maneuver. 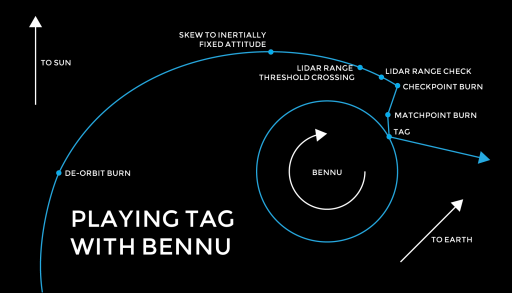 The 5km observation location also provides the best opportunity for the measurement of Bennu’s Yarkovsky acceleration. Next, the spacecraft completes a transition into a one-Kilometer orbit. The Orbit-A Phase of the Mission is 31 days in duration (+45 days of margin) and facilitates the collection of high-resolution data to begin the construction of a global data set. 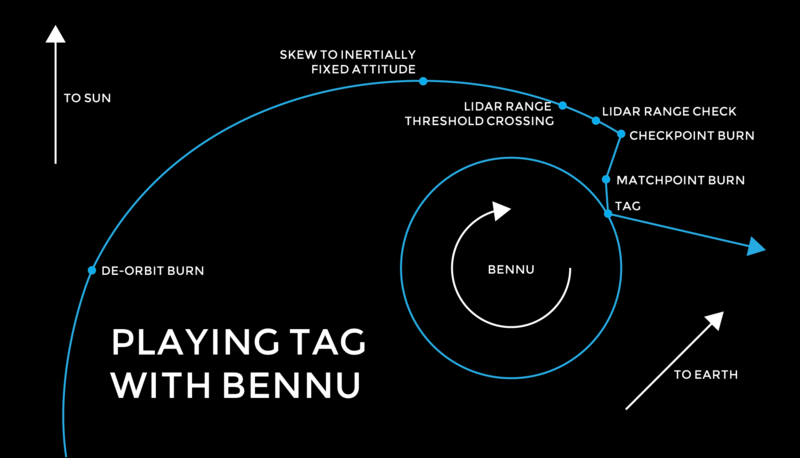 During Orbit A, the spacecraft will be transitioned from stellar navigation using Star Tracker data to a full optical navigation algorithm that uses features on Bennu’s surface. The OSIRIS-REx spacecraft will orbit asteroid Bennu in a polar orbit slightly behind the sun terminator, the boundary between day and night. 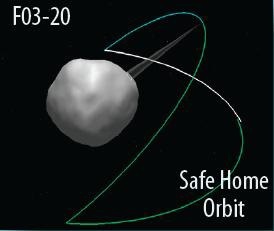 This ‘Safe Home Orbit’ was chosen to allow the asteroid’s gravitational pull and solar radiation pressure cancel each other out – avoiding the spacecraft spiraling to or away from the asteroid over time which cuts the need for orbit maintenance maneuvers. OSIRIS-REx orbits one Kilometer around the center of gravity of Bennu, placing it 730 +/-20 meters above the surface from where the instruments can collect high-resolution data. 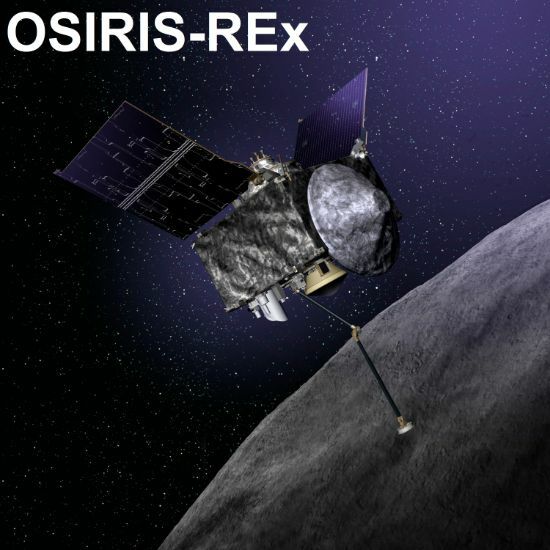 After the Orbit A phase, OSIRIS-REx should be well settled in its operational orbit with good navigation for a 63-day Detailed Survey Campaign during which the entire asteroid surface will be covered by all instruments. Data from these observations will be used to complete detailed assessments of the 12 landing site candidates to allow scientists to narrow the list to the four most promising targets that fulfill all requirements. Observations continue with a 60 +35-day Orbit B phase while teams on Earth are busy finishing the assessment of the landing sites. When in orbit around Bennu, OSIRIS-REx will be in a nadir-pointed attitude for 11 hours each day for science instrument operation with the remaining 13 hours in Sun- and Earth-pointed orientations for power generation and data downlink. After the Orbital Phase of the mission, OSIRIS-REx begins a 98-day Reconnaissance Phase during which the four candidate sites are observed via a series of close approaches. This will allow the PolyCam instrument to characterize the fine structure of the surface at the sites to verify particle sizes present at the sites are suitable for the TAGSAM sample collection mechanism. PolyCam passes come as close as 225 meters while passes for the other instruments use a safer 525-meter distance. A prime landing site will be chosen during the Reconnaissance Phase and approved by all parties involved in the mission with the other three sites taking a backup status. There are a number of requirements aside from surface composition and slope that need to be fulfilled by the prime sampling site. Solar elevation has to be at least 5° for proper illumination for documentation of the sample collection and the operation has to occur either in the morning or late afternoon (local time) to avoid the spacecraft coming close to a very hot surface which could overwhelm the probe’s thermal control system. The relative placement of the Earth and Sun rule out an early morning touchdown because no communications would then be possible during the critical TAG sequence. When OSIRIS-REx has completed its remote-sensing campaign and approval for the sampling site is given, the mission enters a TAG (Touch-And-Go) rehearsal phase that could be as short as 42 days if all maneuvers occur to perfection or take a maximum of 227 days in case either technical issues arise or sampling has to be deferred to more favorable seasonal conditions in the asteroid’s orbit around the sun. Two different rehearsals are planned to simulate the various maneuvers needed for the Touch and Go without actually coming in contact with the surface. These are needed to verify the flight dynamics aspects as well as the onboard systems response to the activities. Two checkmarks exist for the two Rehearsals – the Checkpoint at a range of 125 meters to the landing site and the Matchpoint at 55 meters. The first rehearsal will take the OSIRIS-REx spacecraft from its Safe Home Orbit to a point just after the Checkpoint to validate the procedure from a navigational standpoint, ensuring the multi-day sequence can precisely target the chosen landing site. The Checkpoint Rehearsal begins nine days prior to the mock TAG maneuver with the final unloading of the Reaction Wheels followed by very precise orbital tracking and optical navigation to set up for a phasing maneuver that precisely aims to put the spacecraft down at the right time to intercept the expected sampling site. 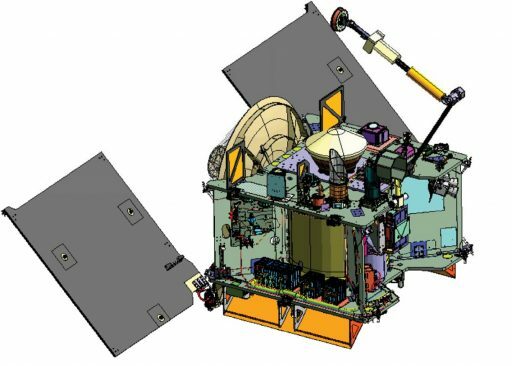 The rehearsal checks whether the spacecraft is able to properly extend its TAGSAM sample arm, acquire a Navigation Attitude and slew to a Look-Ahead attitude where the Navigation LIDAR begins taking data. All navigation data sources deliver data during the maneuver for characterization on the ground in order to identify any deficiencies ahead of the big day. The rehearsal also tests the solar array deflection to a Y-Wing configuration and navigation at close range to the surface. The end of the rehearsal comes at the Checkpoint – no burn is performed and OSIRIS-REx remains on a safe flyby trajectory before maneuvering back into the Safe Home Orbit. The Checkpoint maneuver provides a first confirmation on whether the tight requirements in terms of trajectory and timing can be matched up to achieve an on-target TAG. If the success of the Checkpoint Maneuver can be confirmed, the team sets up for the Matchpoint Rehearsal. This activity is identical to the Checkpoint Rehearsal up to passing the Checkpoint when OSIRIS-REx will execute its Checkpoint Burn to enter a landing trajectory and continue for a dress rehearsal of the next 12 minutes to pass the Matchpoint. This rehearsal has the primary objective of validating the communications during descent and the TAG Attitude Control System mode in which only the reaction wheels are used to keep the TAGSAM mechanism in a normal (perpendicular) attitude relative to the asteroid’s surface with the thrusters only in use when parameters exceed a deadband. The end of the rehearsal occurs around as close as 30 meters to the surface when OSIRIS-REx completes a pre-programmed Backaway Maneuver of around 0.7m/s to escape the asteroid’s gravity. This also verifies the abort maneuver available for the TAG operation. Pending reviews of the two (or more) rehearsals of the TAG (Touch An Go) maneuver, OSIRIS-REx will be cleared for its first TAG attempt. Per the baseline schedule, TAG is expected to occur in July 2020, however, the exact date will depend on the progress of the remote-sensing campaign and the two rehearsals. A Thermal Keep-Out exists for the period of December 13, 2019 through April 7, 2020. During this 204-day period, Bennu is within 1.15 Astronomical Units to the sun as it passes the periapsis of its 1.2-year orbit. Sampling is not possible during this time because of excessive surface heating. 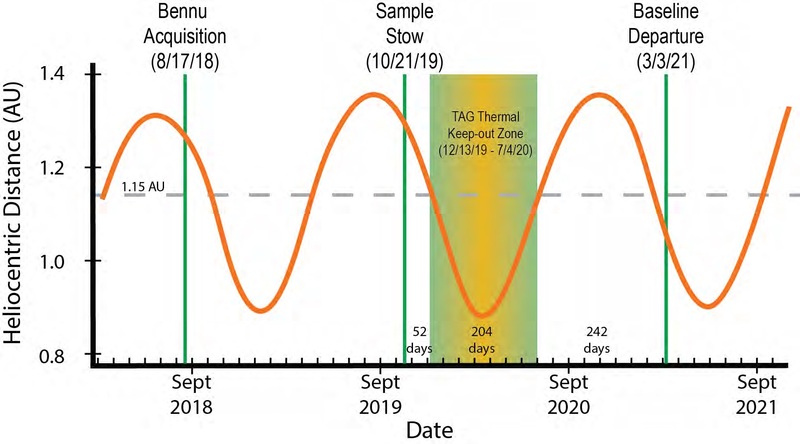 The Touch and Go Sample Collection sequence has a baselined duration of 23 days from the last Reaction Wheel Desat through the Touch and Go and the stowage of the sample. 42 days of schedule margin have been built into the baseline mission to facilitate a second TAG attempt should the first one be aborted. OSIRIS-REx carries three Nitrogen bottles to facilitate three sample collection events with actual surface contact. 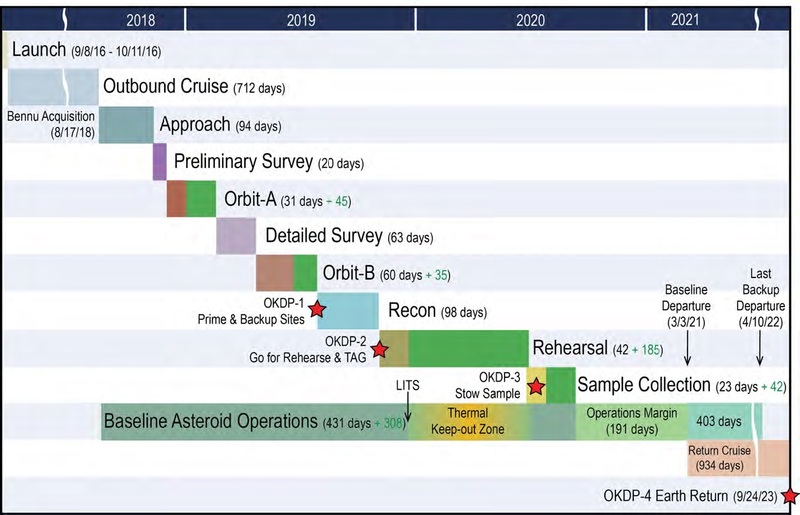 There are at least 27 weeks of margin in the baselined mission plan at the asteroid, proving sufficient time for many sampling attempts should the operation turn out to be more complex than envisioned. A complete overview of the OSIRIS-REx sampling system and the Touch and Go Sample Collection can be found here. After the completion of Sample Collection and Stowage into the Sample Return Capsule, OSIRIS-REx enters a Quiescent Phase to await the proper timing for the spacecraft’s departure and return to Earth. This mission phase could be as long as 499 days if all mission objectives are accomplished in a perfect fashion per the fastest possible schedule not taking advantage of any of the built-in margins for the different phases. No operations are planned for this mission phase, however, the science team may elect to place the spacecraft back into its Safe Home Orbit to continue the collection of science data in different seasonal conditions. Asteroid departure, per the baseline mission schedule, is set for March 3, 2021. The mission team can opt for an Early Return with departure on January 3, 2020, shortening the stay on the asteroid by 425 days. This option would give scientists hands on the sample a full year earlier than planned. 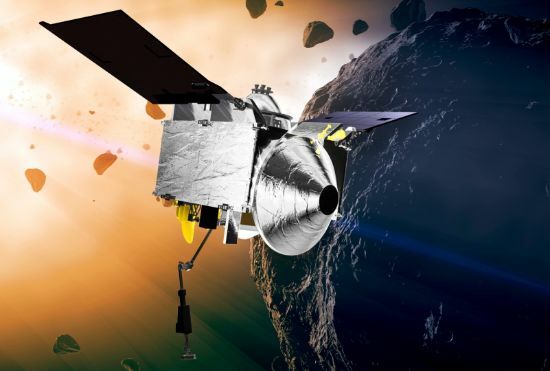 The latest possible departure is April 10, 2022 which would give the mission 1,333 days at the asteroid for extended remote sensing if deemed of scientific promise. If sticking to the planned Asteroid Departure, OSIRIS-REx would have to perform a 328-meter per second departure burn using its four main engines, placing the spacecraft on a return trajectory. The Asteroid Departure Maneuver places OSIRIS-REx onto a ballistic return cruise to Earth with no large maneuvers needed along the way. As a safety feature, the trajectory is set up to safely pass Earth if, for any reason, communications from the spacecraft are lost. Tracking is performed and Trajectory Corrections are executed as necessary to precisely target the entry corridor. Re-Entry plans and preparations for the landing begin around one year in advance. 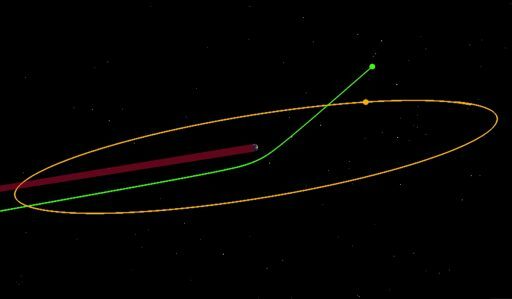 Trajectory Correction Maneuvers place the spacecraft on a path to pass Earth at a distance of 1,000 Kilometers with maneuver placeholders at Entry E-60 and E-30 days. At E-7 days, OSIRIS-REx executes a TCM to target its precise entry location with a clean-up maneuver at E-4.5 days. In case tracking reveals any trajectory errors, a TCM can be performed as late as Entry E-12 hours. Release of the Sample Return Capsule occurs at E-4 hours in a sequence starting with the disconnection of power and data cables via pyrotechnics cutters ahead of separation accomplished by a pyro mechanism and a spin-up system to provide stabilization to the Sample Return Capsule. OSIRIS-REx completes a divert maneuver at E-3.7 hours in order to lift its perigee altitude to 250 Kilometers to fly past Earth and avoid destruction by re-entry. 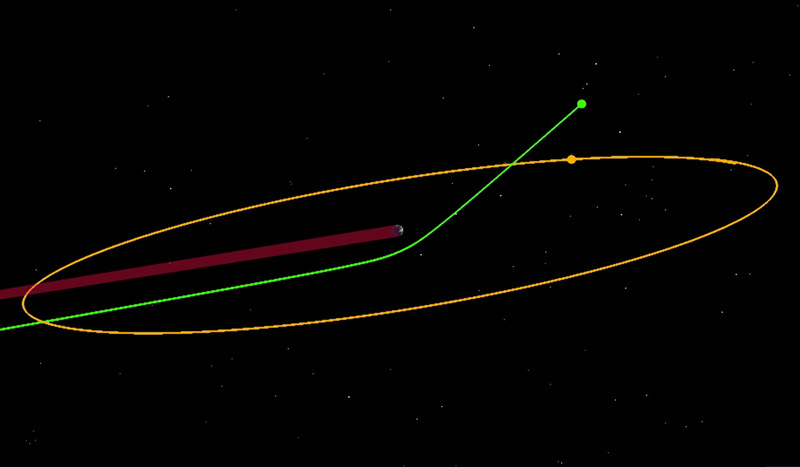 The spacecraft enters a 0.5 by 1.0 AU solar orbit where it is tracked for another month to get a precise handle on its long-term trajectory. Whether an extended mission is possible for the OSIRIS-REx spacecraft and its science instrument suite will depend on the propellant remaining on the vehicle, the performance of its systems and the allocation of funds. The Sample Return Capsule (SRC) is aiming for a steep re-entry at an Entry Angle of 8.2 degrees and a speed of 12.2 Kilometers per second. 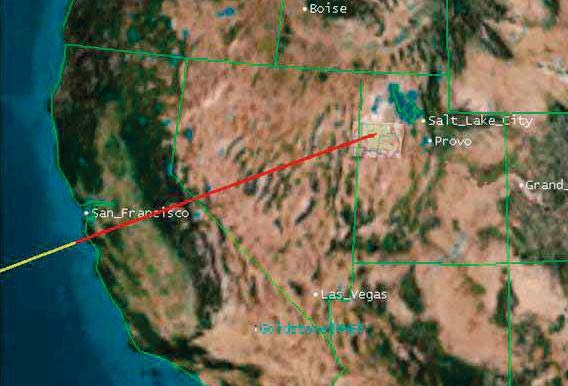 Re-Entry will start just before the vehicle crosses the California coast line just south of San Francisco, flying on a 62-degree azimuth heading. SRC will pass over Central California and Nevada heading to the north-east toward its landing site in north western Utah. The Sample Return Capsule is set to encounter Entry Interface at 14:38:29 UTC on September 24, 2023. Landing is set to occur 810 seconds later in an ellipse of 20 by 80 Kilometers as some uncertainty exists in the descent trajectory of the vehicle caused by variations in atmospheric conditions. 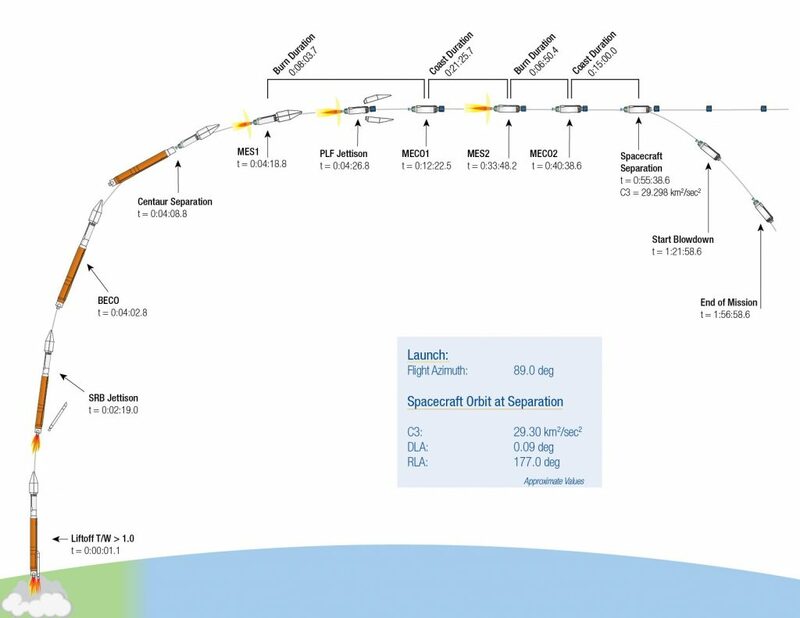 >>Detailed Overview of the Sample Return Capsule and Landing Sequence. The successful landing of the Sample Return Capsule marks the start of a two-year sample analysis operation. 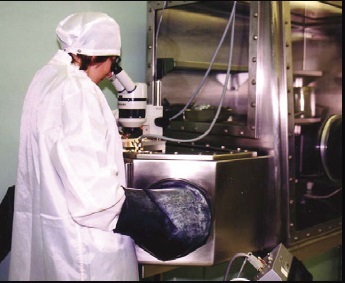 Upon recovery, the SRC is transported to NASA’s Johnson Space Center in Houston, Texas where the sample canister is opened for access by the science team and the international cosmochemistry community. Per the operational plan, OSIRIS-REx will deliver at least 60 grams of sample material of which 11.5 grams are reserved for immediate analysis, 3.5g are margin and 45g are archived for future generations should more evolved analytical methods be developed. Within six months of landing, the OSIRIS-REx science team delivers a catalog containing sufficient information to allow the science community to propose research with the samples. The next six months will feature analysis of the sample material to address the mission’s science objectives.